Saving a tree a byte at a time. This past weekend I went up for some wine tasting, and my friend exclaimed why is it that print at home confirmations always take two pages, and the second page is almost always irrelevant. Why indeed. Web designers should think about confirmation pages after purchases, e-tickets for planes, will call receipts, restaurant reservations, etc. to keep the content to be printable on one page. As we increasingly have print your own documents, making sure they only use the paper necessary can make a big difference. Especially when you think that for that application you can save 50% of the paper used. Not many changes in processes can make such a difference. So until web producers get it, look at your receipts in preview mode and only print the pages necessary. That would reduce the number of trees needed. Hmm, it really is interesting to see the articles in the papers these days. The past few days I've been seeing ones like this one which ask you why should consider walking away from your loan. What troubles me about a lot of these stories is they focus on the economic argument for walking away from the loan. But they don't ever talk about the moral one if you can continue to pay your mortgage. What it highlights is the short term thinking that dominates our thinking. People made the assumption they could sell their home for a profit, maybe they were planning to live for a short period of time. Maybe they thought prices only went up. But what they failed to do was take a long view of what might happen and they also failed to take a long view of their obligation. Has this type of abdicating of a lease extended to the lease we hold on our planet. Except for one small detail, we can't walk away from our planet (at least not yet). But given they way we treated our bank balances and our planets. Maybe we can only think one way and one way only. If you walk away from your commitments when it's hard, were they commitments at all? Can the "Best and the brightest" save us now. the best and the brightest meant you made a lot of money, if you make a lot of money you buy a lot of nice goods, so if you have a lot of nice goods, you must make a lot of money, and if you make a lot of money, you must be the best and the brightest. But what fails in that analysis is that there are a lot of ways to come into possession of money that does not mean you are smart, winning the lottery for instance. So the current mess is a mess of false presentation, be it ponzi schemes, false appraisals on houses, bad science. In the end money is money, and stuff is stuff. Don't mix up the two. Too bad, we ended up trashing the planet to act like we were the best and brightest, but in the end we were just plain dumb. We had an incredibly nice weekend, but then like whiplash, we went back to the cold. Making new record lows temperature wise, not stock price wise. So I had a dilemma, should I turn back on my heater which I turned off before my extended trip to Europe. Given that I've been driving a lot, it didn't seem right so I kept it off. My solution, extra blanket. So far so good, some times the old ways still work. Carbon Emissions free. People can be into power games, it's really funny to see it in action. There is something about our egos and the need to assert it. One example of ego mentioned in Tom Vanderbilt's Traffic was that people take more time to start backing out of parking spaces when someone is waiting. It's a "I got you now sucka" moment where you are in control. Another case that I've observed but not seen documented is do pedestrians walk more slowly when I car is waiting? I don't have evidence but it does seem that people slow down when they have control. Now I am all for pedestrians exercising their rights, but the other day I saw a person take their own sweet time across a garage entrance while 3 cars were waiting. In this case, there were 3 cars taking more time idling spewing out green house gases. Not very eco. So in that case it would have made sense for the pedestrian to pick it up a little so that the cars would wait a little less, and the pedestrian would be closer to the destination at hand. It's not necessary to run as a pedestrian to help out the cars. (I cannot believe that I am saying this). Yes, I know the argument that those cars shouldn't be driving in the first place, but the reality is that our transportation system are webs of interconnected systems, and keeping them working together smoothly means that all parties must give and take. Sometimes you do want to run not walk, even if it is to help a car. If you ever have come in on a flight in the middle of the night what strikes you is how much the city still glows. There are lights on all the time, from the street lights, to the office lights, to the 24 hour quickie marts that dots the landscape. Electricity in action abounds. The same occurs at home, all the appliances and lights that we leave on. I live next to a vacant house and the landlord has set up some timers to give the illusion that someone is there. Reminds me of George Washinton at Valley Forge that lit false fires to give the British the impression that there were more troops than there actually were. So what does that mean for us, how much hidden electricity is disappearing in our lives. Will we ever get it back. A big culprit in this tons of hidden electricity is that most of what we use have electrical switches instead of mechanical switches. Perhaps a return to true switches will cut the hidden electricity of our lives. So when in doubt, disconnect. It only takes a moment to plug it in and pull it out. The simplest mechanical switch there is. It does seem like the world is falling apart. We have global warming, combined with a drought and our financial system seems ready to collapse. These seem to be completely unrelated but they might be wholly connected in that they are a product of a world disconnected from the reality of it's day to day and a love of abstraction. We create environmental systems of combustion where we look at 50 - 100 year spans and say, that it's possible to live the way we do, but the model breaks down at year 110. We think in terms of building farms that rely on good weather all the time, when the world has had periods of extreme weather changes such as ice ages, desert seasons that lasted for millennia? And we create economic models where people are perfectly rational and we know what's happened before. An all these have failed. I think it's because that the assumption is that the world can be understood in clean clear ways, that equations if complex enough can work out the messiness. But perhaps the messiness is not noise, but the data. And if we start asking ourselves if noise is normal, then how do we adjust. But that fails, it's not about adjusting because that implies transition from one phase to another. It's time to embrace the messiness, the suddenness and build our actions around that. Control in chaos or control is chaos. Maybe that's what's next. It's been awhile since I've posted in earnest, and after an eco unfriendly jet from California to Europe. A few days of recovery, and I am almost sleeping at a normal schedule, the key word is almost has given me some time to reflect. There's been a lot of talk about the Paris rent a bike system in the American press, but it's not limited to Paris. 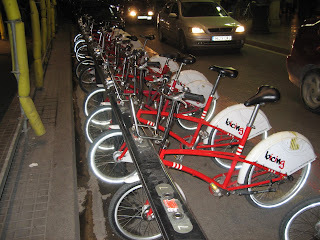 In the cities of Barcelona ("Bicing") and San Sebastian ("Bicincitta") there are now rent a bike systems as well as witnessed below. - sufficient density. 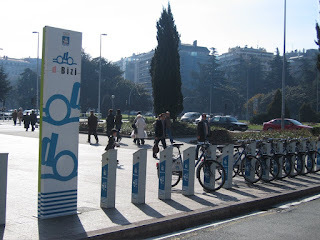 Both Barclelona and San Sebastian are fairly dense cities, so if you borrow a bike it's only a short journey to make it possible to get something done. - flat terrain, I did a lot of walking in both cities and I think the total elevation change was limited to going underground for the subway. It's that flat. In San Francisco I think, an Embarcadero rent a bike system would work but beyond that it's not clear the average commuter would have the legs to make it up the hills of San Francisco. But the Embarcadero and Market street areas are sufficiently flat that it would be entirely possible. The popularity of the Blazing Saddles bicycle rental means that there is a market. - Reasonably safe bike routes. One of the things that impressed me about Barcelona was that many of the Barcelona major boulevards had bicycle and cycling lanes right down the center. - Good weather. Warm climes definitely make it possible, curious to how the Paris system works. Bicycling as an on demand system has potential.